Now, I get it, technically speaking, this isn’t a movie. More of a short since it doesn’t really meet the 75 minutes and up criteria that a lot of people consider a release as a feature length film, but I figured that it was something I needed to see, having heard good things for so long about it. I really loved Darren Lynn Bousman’s work with the Saw franchise and Repo! The Genetic Opera, so when it came time to test out another of his works, I was excited. Until I saw it. I must say, it wasn’t all bad, but none of it was particularly good. 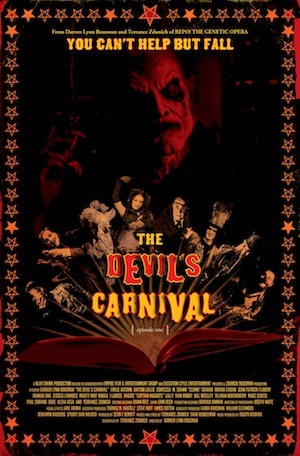 The plot revolves around three newly deceased souls who enter a purgatory-like place called The Devil’s Carnival, where they proceed to be judged based on the nature of their sins in life. The three stories are based on Aesop’s Fables, but I didn’t feel any connection to any of these characters. All we ever really know about any of them is how they died, which I would say is important information, but I can’t root for or condemn anyone based on the nature of death as it is usually something out of one’s control. John (Sean Patrick Flanery, TV’s Dexter, The Boondock Saints)commits suicide out of grief for the loss of his son. Tamara (Jessica Lowndes, TV’s 90210, The Haunting of Molly Hartley) is murdered by her boyfriend. Ms. Merrywood (Briana Evigan, Step Up 2: The Streets, Mother’s Day) is killed in a shootout. Each one goes through several macabre steps but the motive is unclear. The performances from much of the cast fine, with special points to Paul Sorvino (GoodFellas, Jersey Shore Shark Attack) as God and Terrance Zdunich as Lucifer. The whole issues comes down to whether or not this is actually anything new. The entirety of the film felt to me like passed over ideas from Zdunich’s previous work with Bousman in Repo! 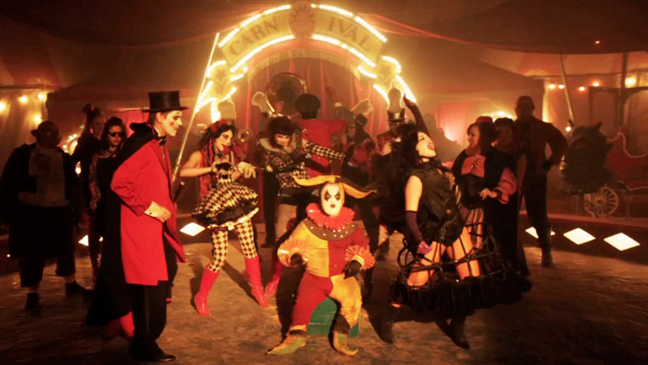 The Genetic Opera, a more refined and much stronger rock opera with definite character development. I felt like the film I was watching came down to just watching these people meander this strange environment, but I just thought there would be more to it. The music is another factor here. It is uneven and just not all that engaging. The makeup is a reason to see it, but not a reason to love it. 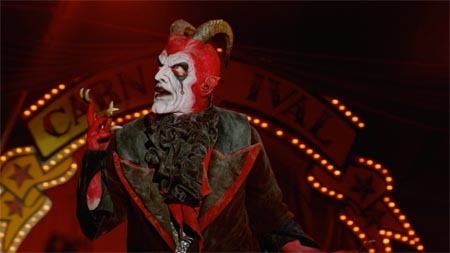 I would say that The Devil’s Carnival has been done before, and if given the option, I would pick the far superior Repo! for my viewing pleasure.